If you have been on Pinterest I’m sure you have seen the pin showing how to bake a cake with a heart shape running through the middle. The pin is just a series of photos merged into one long photo showing the process. I was unable to find, and believe me I searched all over, but could not find written/detailed instructions on how to do this. So even though there was a pin I was still on my own on this one. The pictures were self explanatory so how hard could it be? Right? Well it wasn’t difficult. It sure would have been nice to have some pointers with experience behind them. Well I’m going to share what I learned from the mistakes I made and the things I did right. A 9×13 pan to bake the first cake in. A loaf type pan to bake the final cake in. I did not have a heart shape cookie cutter like used in the pin but I did have a pack of star shaped cookie cutters in various sizes. I choose the smallest one. That was my first and second mistake. I should have used a more simple shape, one without pointy small parts. I also should have used a bigger cutter. I lined my 9×13 pan with a product that is parchment paper on one side aluminum foil on the other. You could grease and flour the pan if you prefer. Bake the cake according to directions on box. Looking back maybe I should have added an extra egg to the mix to make the cake denser. 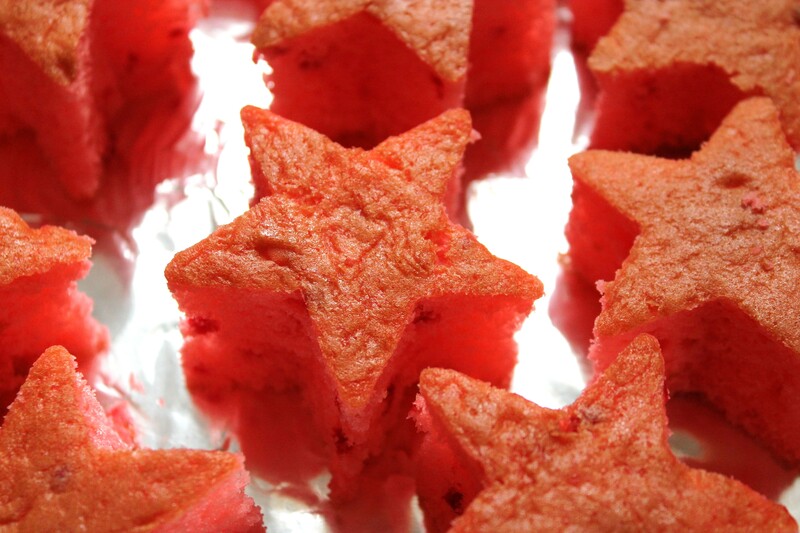 Let cake cool, use cookie cutter to cut out the stars. I just cut out as many as possible. My dad just happen to come by as I finished cutting out the pieces and he offered to ‘dispose’ of the scrap pieces of cake I had left over. He is too kind. I only had a loaf pan. I knew it wasn’t going to be large enough for this project. Yet the crazy woman in me said, just do it. Here’s where I made the third mistake, well fourth if you count using to small of a loaf pan. I put a bit of batter down in bottom of pan before lining the pan with the shape pieces. Don’t do this. My next but not last mistake was I did not cram the pan full of the star pieces. I lined them up like the pin showed but I should have packed them in tight. There were gaps. Did it occur to me that those gaps would get filled with chocolate batter causing things to go wrong? No. So I poured the batter in over the star pieces. 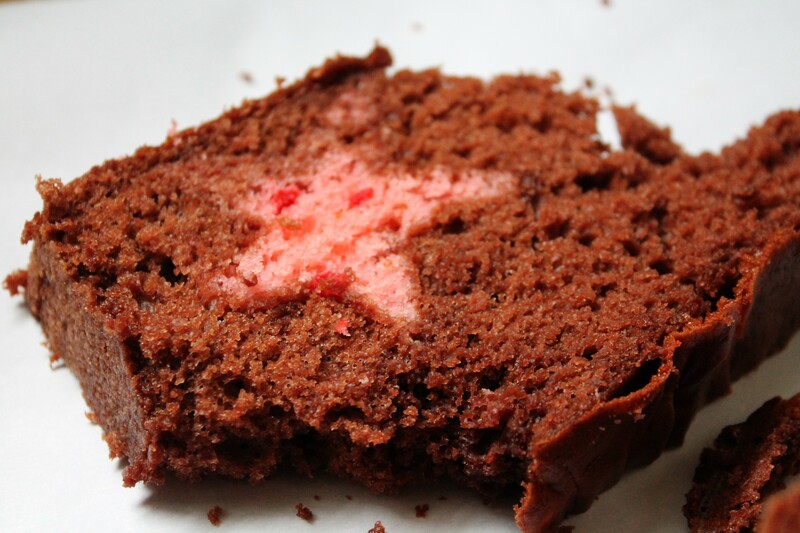 Of course the batter oozed between the stars and a few stars moved around because I poured the batter in to fast. You should spoon your batter in, you will have more control. The pan was too small so the cake overflowed some. 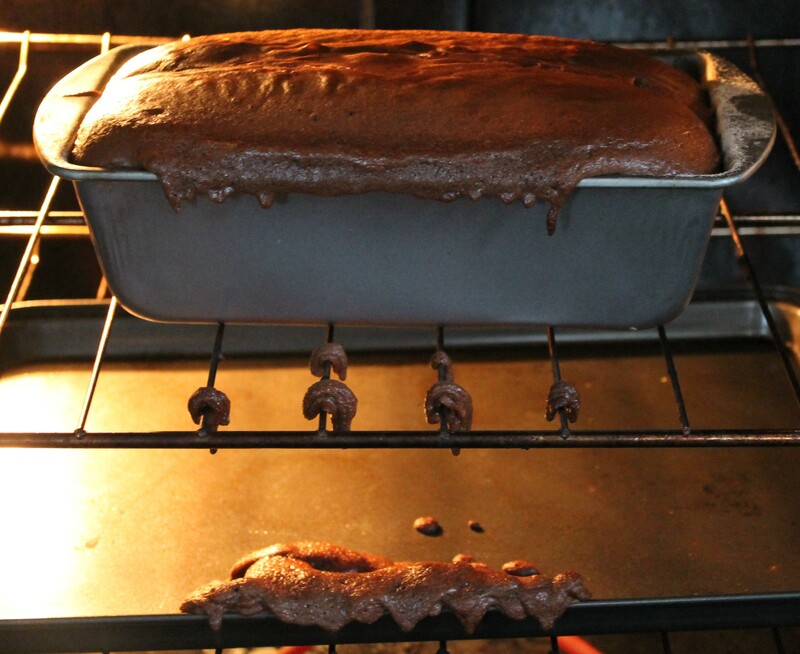 I was prepared for this, I had placed a pan under the cake to catch any overflow. When she see the photos you will notice I did not place the catch pan in the best spot. Clean up was still easy though. I turned the baked cake out of the pan to let it cool. As you look at the pictures I promise there is a star shape in there…somewhere. 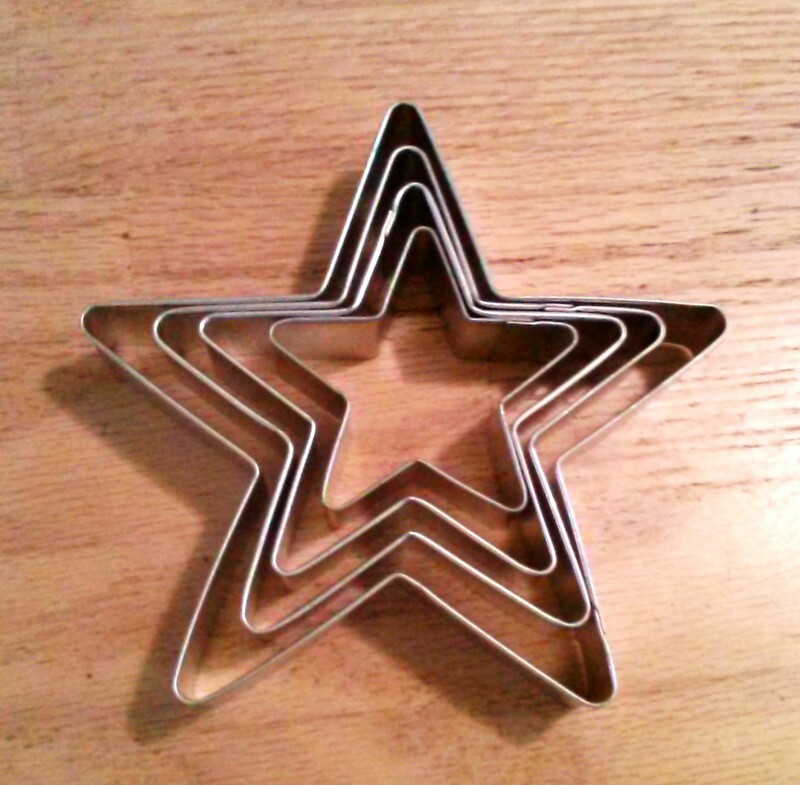 Simple shape cookie cutter. Skip the star shape. Don’t use the smallest cookie cutter. Use the deepest loaf type pan you have. 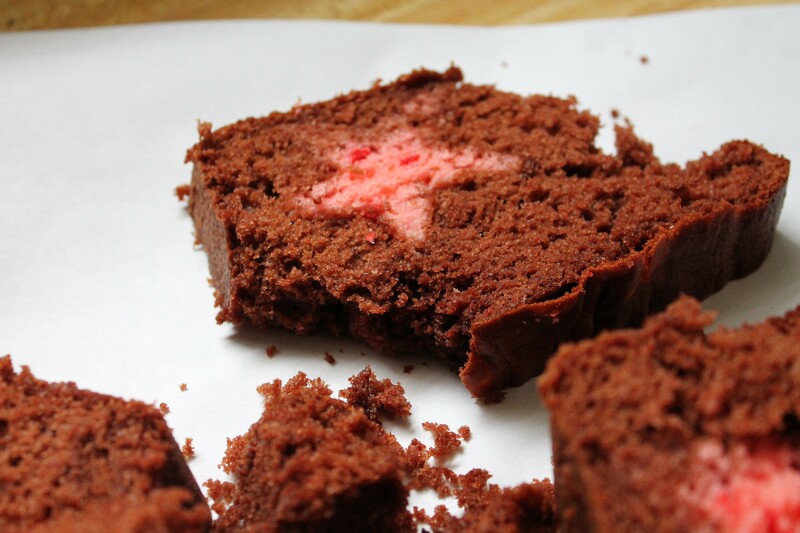 Don’t pour any batter on bottom of loaf pan before placing in your cut shape pieces. 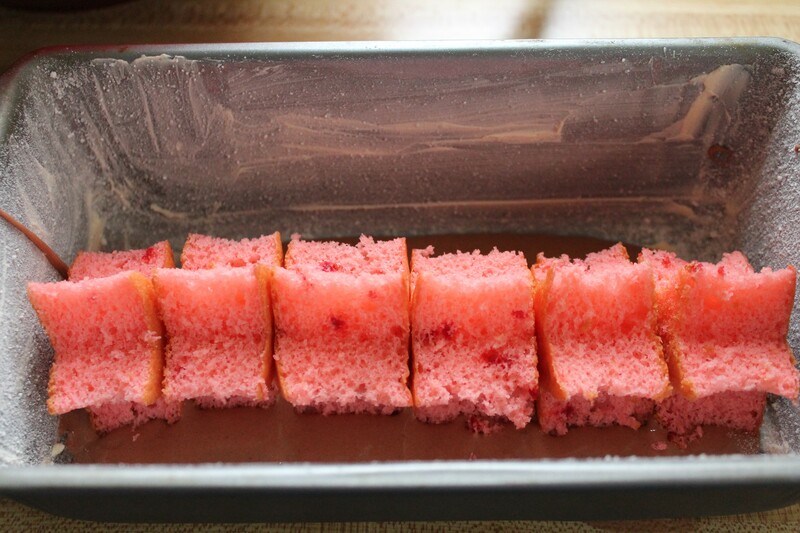 Cram the cake shapes in line so there isn’t any gaps for the batter to ooze between. 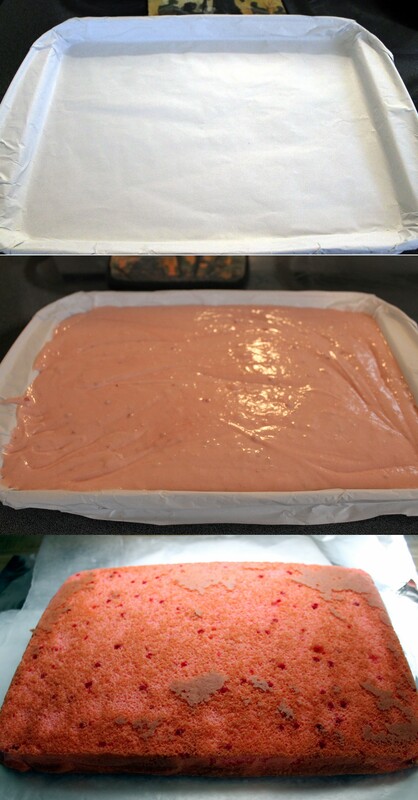 Spoon batter slowly over cake shapes so not to displace them. There’s a star in there. I promise. I will try again and I will perfect this. I actually have an idea of my next shape in cake, cake. It is Halloween themed. I will share it with you when I make it. Thanks for joining my on this very Pinteresting cake adventure.